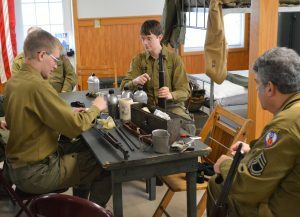 Fort Indiantown Gap, PA: A mishap with a mortar last Friday, during a WWII battle simulation, landed a 22-year-old New Jersey man in the hospital – and caused the cancellation of tactical activities for the remainder of a highly popular event. 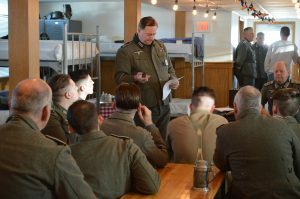 The accident occurred at the Fort Indiantown Gap National Guard Training Facility during the WWII Historical Association’s Battle of the Bulge Commemoration. 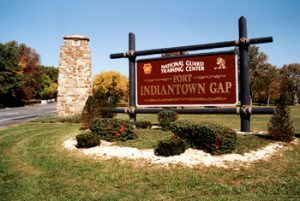 Fort Indiantown Gap (also known as FTIG and the Gap) is located about 23 miles northeast of Harrisburg, PA. A U.S. Army post with a history dating back to the French and Indian War, the Gap served as a major training facility during WWII. The 18,000 acre base sports numerous field ranges and fixed sites – perfect for recreating the life of a foot soldier in occupied Europe during the brutal winter of 1944. The Gap is currently controlled by the Pennsylvania National Guard. The Battle of the Bulge Commemoration at Fort Indiantown Gap is one of the largest WWII living history events on the east coast of America. The event is held every January to honor the men and women involved in the last major battle in the European Theater of Operations. Larry Mihlon, Public Affairs Officer for the WWII Historical Association, told the Baltimore Post-Examiner the Association has been staging Battle of the Bulge reenactments at the Gap for about 30 years. “We had about 1400 registered participants this year. Not sure on the public number, but I would guess that we had about 500 visitors. Of course, the public is never allowed out in the ranges where the tactical reenactments occur. They enjoy the displays and interaction that we have in the Area 13 (encampment) vicinity. Mihlon told us that for a reenactor to participate in the Battle of the Bulge event, he must complete a battery of paperwork. “One of the layers of that paperwork is a requirement that the reenactor be a member of an approved reenacting unit or WWII club. We expect the leaders of these organizations to train their men. “We certify the clubs routinely to do things like operate vintage vehicles, hold safety briefings, do weapons checks, and demonstrate that they know how to store ammunition. But despite all of that, it amps up our response when an accident happens. Of course, if it’s operator error, there is only so much we can do. But we take every step that we possibly can to make sure accidents don’t happen. Suspension of the field exercises meant many reenactoors went home early. The exodus began on Friday evening and continued throughout the day on Saturday, leaving the parade grounds around the encampment quiet and many of the barracks bare. For those who stayed to enjoy the social activities that were on tap for Saturday night, the order of the day was education. 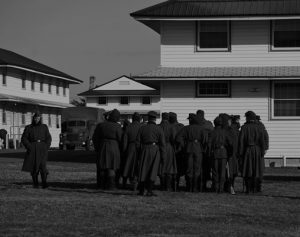 Late Friday evening, dozens of reenactors could be seen standing outside in 14-degree weather as club leaders went over vital protocols. We asked Mihlon if liability is a concern? “That’s always a concern, but it isn’t a driving force. There have been accidents in the past, but they are a rarity. Mihlon applauded the hardy club-members who huddled in the cold for the twilight emergency safety briefings. But he also noted that a reprimand could be in the offing. Does Mihlon see any potential problems down the road with using the base for the reenactment? “Well, we’re guests here, so it’s up to the National Guard. They know the measures we take to police our own people; to follow every rule; and they have always appreciated that. Our experience with the base has always been great. There is no time-table for the completion of the National Guard investigation. However, the WWII Historical Association has already vowed to make one important safety concession. In a post on the group’s Facebook page, Alwyn Bryant – a vice-president of the Association – said moving forward, they will have a private ambulance on site for the reenactment events. Bryant noted that, while the reenactor medics and professional EMTs responded quickly and efficiently, the ambulance which carried the injured man to Hershey had to travel to the Gap from Lebanon – some 30 minutes away. Hershey Medical Center is located southeast of the base – about a 20 minute drive via the closest route. A note on the garrison emergency services page says that emergency calls are answered by Lebanon or Dauphin County Emergency Management Agencies. The victim of the accident has been discharged from the hospital and is said to be resting at home and in good spirits.